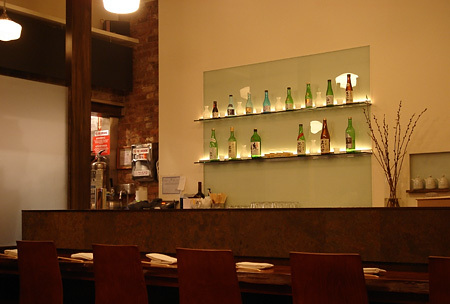 Went to try the new soba restaurant Sobakoh on 5th Street (by 2nd Av.) last night. Being barely a week old, there were only two occupied tables when we arrived at around 7:30 pm (whereas even crappy places in the neighborhood are packed by that time on a Friday night), but the place quickly filled up afterwards. The clientele, at least last night, was mostly Japanese with only one non-Asian couple in the crowd. Speaking of which, the staff is very, very Japanese. Our waitress barely spoke English. In fact, I haven't come across a Japanese waitress so lacking in her command of English in a long time. I felt like I was in Tokyo. There was a lot of pointing and speaking slowly when we were ordering. This being a soba restaurant, the buckwheat noodles here are all hand-made (and also organic, the menu claims). The food, overall, is about as good as Sobaya's a few blocks north, but a notch below Honmura An's. 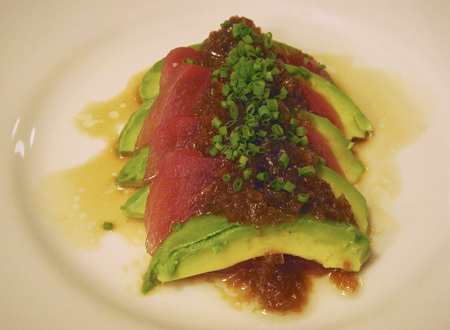 First we had Tuna & Avocado ($9). I wanted to order some other, more interesting appetizers, but for some reason all the ones I wanted to try were sold out. It was only 7:30, so I guess they sold out of the ingredients earlier on in the week? 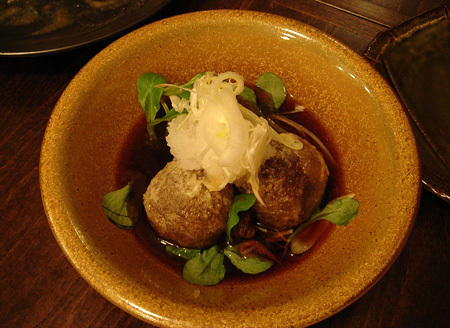 More bizzare was the Age Soba (fried soba). We didn't order it, but later on in the night after seeing almost everyone in the restaurant order it, we decided to follow the herd and try it ourselves. We were told that it was just sold out. 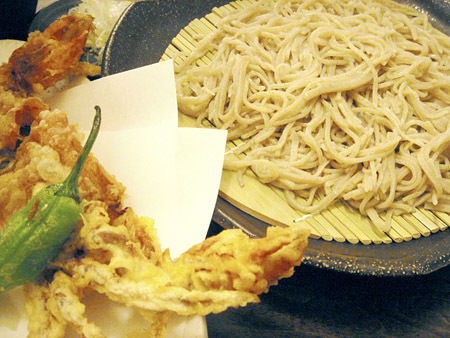 How could fried soba be sold out? I didn't understand. They still had regular soba. So why couldn't they fry some up? Alas, the question remained unanswered since the staff had trouble speaking English. They were appropriately apologetic, however. I suppose I have to cut them some slack since they just opened. Might just be opening week wrinkles. In any case, the Tuna & Avocado was nicely executed. It's not a sophisticated dish so it's hard to screw it up. The ingredients were fresh, the tuna of very high-quality. Next up, Albacore Spicy Miso ($8.50). 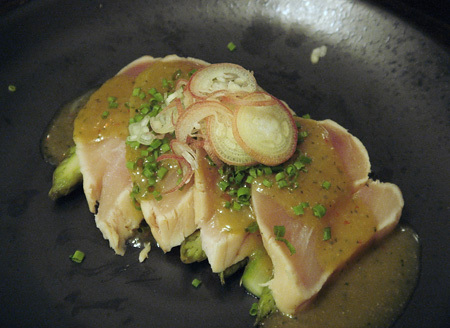 Smoked albacore slices on a bed of green asparagus and covered with spicy miso sauce. It was really, really good, and as it turned out, the best dish of the night. Agedashi Soba Gaki ($7). These were fried soba "gnocchi" (the menu called it a gnocchi, not me) stuffed with ground chicken served with light sauce, ground Japanese radish and Japanese scallions on top. They were interesting, but taste-wise they didn't do much for me. They reminded me of Chinese dishes with taro. 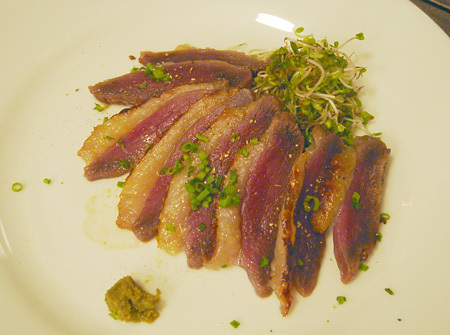 Another appetizer we tried was the Grilled Duck Marinated in Miso ($9.50). This was not at all what I expected it to taste, and in a bad way. The duck had the consistency and taste of jerky. I assume that's on purpose but I don't know why. As soon as I bit into one I said, "What the hell?!" Those were the appetizers. They were uneven. Couple good, one bad, one so-so. Next up were the main courses. I had the Uni Ikura Cold Soba ($18). I thought all the soba dishes were a little overpriced (save for the plain, which was $8, but none of us ordered that). For $18, I got about a nigiri-sized portion of uni and ikura each. (Though I guess if you count those as $4 each and added that on top of $8 it would be close to $18....) But the uni and ikura were both of the highest quality so I guess I really shouldn't complain that it's expensive. A lot of times when you get these type of dishes in a non-sushi restaurant the raw ingredients aren't that great, but these were definitely sushi-grade. 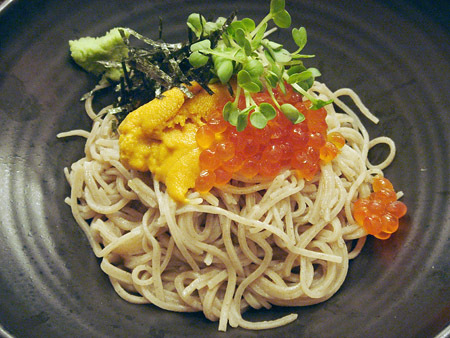 And since I love uni and ikura, I liked this soba a lot. I only wished it came with more uni and ikura. It came with the soba sauce on the side which you pour into the bowl yourself to taste. One of my dinner companions ordered the Soft Shell Crab Tempura Cold Soba ($15). I didn't taste it so I have no comments. Just look at the pretty picture and imagine... I'll just say he seemed to enjoy it. I did have a taste of the Ebi Ten Seiro Cold Soba ($18) another one of us ordered (not pictured). It was soba with a single jumbo size shrimp tempura on the side. Again, like my own dish, I thought for $18, maybe it should have come with more (2 shrimps?). But it was a really, really good shrimp tempura. I don't order tempura often, but this is one of the best I've tasted. Still, $18 for one shrimp tempura is pretty expensive. Generally I have no problems paying high prices for good food. And the dishes I claimed were perhaps overpriced were really good. I guess I just didn't expect it in what I consider a simple, neighborhood soba joint. That was our meal. With a couple of hot sake and a beer, the bill came out to $150 after tax and tip. Like I said earlier, if you really want the best soba, I would still recommend Honmura An (make sure you order the soba maki), but it's not quite fair to compare the two. Sobakoh might not be cheap, but Honmura An is still another level altogether. For something a little simpler, you now have another option here in the East Village in addition to Sobaya. If I had the chance to try more of their other interesting appetizers which they were sold-out of (and obviously if they were good), I might give the edge to Sobakoh over Sobaya.